The XPetroleum will bring much new digital technology to the supply chain, procurement, finance parts of the oil industry. As planned and promised, we have launched the pre-sale today! 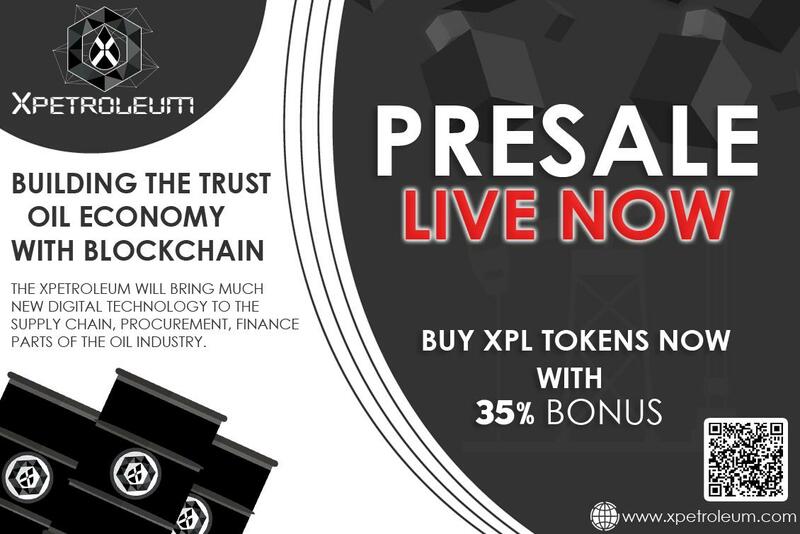 Purchase your XPL tokens within a minute. The tokens will be credited to the ERC20 address you used for the token purchase. Please note that wallets from exchanges are also not acceptable. Sending ERC20 tokens to exchange wallets or non-ERC20 wallets will never go into your account and may be permanently lost. Compatible Wallets are: MyEtherWallet, MetaMask, Mist, Parity, imToken. ▶ Recommended gas price is 30 Gwei. Recommended gas limit is 100,000.
will receive your XPL tokens to the same address from which you sent the funds. ▶ Do NOT send ether from an exchange address (such as Coinbase). You will lose your XPL tokens. ▶ If you have your Ethereum on an exchange or hosted wallet (such as Coinbase), you MUST transfer this Ethereum to a ERC20 Compatible wallet prior to contributing. ▶ Double-check the pasted contract address. Use address only from https://xpetroleum.com. ▶ Minimal contribution from 1 person is 0.1 ETH. If you send less, your transaction will be rejected. ▶ Error encountered during contract execution: Out of gas. � Check your gas limit, it�s too low. ▶ Need extra help? Don�t have a wallet setup? Here is a step by step guide on how to setup a new Wallet on MyEtherWallet. Here is a guide on how to Send Ethereum with MyEtherWallet. They also have a video guide here. You should ensure that your ERC20 compatible wallet is setup with Ethereum inside it before sending to the crowdsale. Blockchain offers many features to make back-office work more efficient: Transparency, Financial transactions, Enabling performance-based contracts, Track provenance for authenticity, Secure, Cost and Time. Petroleum is a general term for oil and natural gas. Oil is the world�s most important fuel and underpins our high standard of living. It provides modern convenience and freedom of movement and is crucial to transport systems. Oil has become the world�s most important source of energy since the end of World War II. Oil is a lever for economic and social development in the twenty-first century, because it brings in hard currency from abroad and because, linked up with other industries, it is a good that can increase its value importantly, creating many jobs. Decentralized Currency � XPL is a peer-to-peer, next-generation oil platform token with an average transaction time of few seconds! Cost and speed � XPetroleum will have nearly instant transaction times and reduced cost of transactions. Safe and Secure � ERC20 is the token standard of the Ethereum smart contracts platform.Transactions are guaranteed and secure. Eliminates the Third Party � XPetroleum eliminates the dependency on third party intermediaries in all major oil sectors. Locked Team Tokens � The team tokens will be locked using the smart contract for 2 years. Which wallets can be used to store XPL? XPL is an ERC20 token, and can be stored in ERC20 compatible wallets. How will I receive my bonus tokens? We will be given to you automatically into the wallet you bought tokens from in the Main Sale. XPL token will cost $0.15 USD. What exchanges will list the XPL token? We will announce the official listing into the exchanges after Main Sale. If you�ve got a question about XPetroleum, a problem we can sort out, or some feedback that would help us get better, we�d love to hear from you. All questions and inquiries will be attended to in a professional manner.